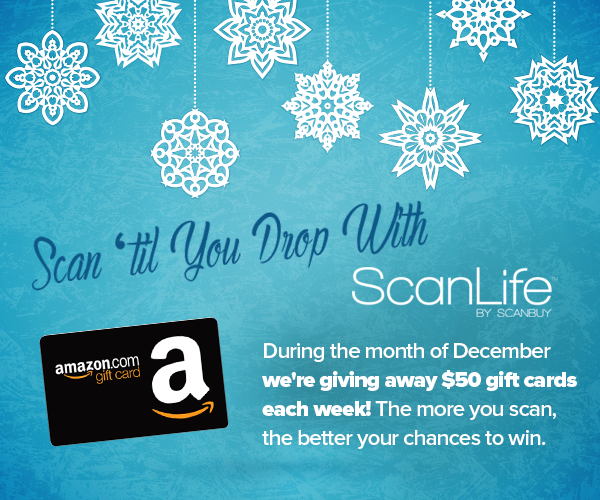 To celebrate the holiday season, ScanLife is giving away prizes to the top holiday scanners. Every 7 days in December, we will reward the top scanner for the time period with a $50 Amazon Gift Card. At the end of the month, the top scanner for the entire month of December will also receive a $100 Amazon Gift Card! 3) Scan as many product barcodes or QR Codes as possible from December 1, 2016 to December 31, 2016 for a chance to win gift cards. 1. Eligibility: Scan ‘Til You Drop With ScanLife (the “Promotion”) is open to ScanLife and Code Scanner app users in the U.S. who are at least eighteen (18) years old at the time of entry. Employees of Scanbuy, Inc. (“Main Sponsor”) and its affiliate companies, suppliers as well as the immediate family (spouse, parents, siblings and children) and household members of each such employee are not eligible. Subject to all applicable federal, state, and local laws and regulations. Void where prohibited. Participation constitutes entrant’s full and unconditional agreement to these Official Rules and Main Sponsor’s and Administrator’s decisions, which are final and binding in all matters related to the Promotion. Winning a prize is contingent upon fulfilling all requirements set forth herein. The Promotion consists of a contest (the “Contest”). 2. Timing: The Promotion begins on December 1, 2016 at 12:00 p.m. Eastern Time (“ET”) and ends on December 31, 2016 at 11:59 p.m. Eastern Time (“ET”) (the “Promotion Period”). Administrator may, in its sole discretion, modify, amend or revise the Promotion Period. Please be sure to check this page periodically for updates to the Promotion Period; if Administrator makes changes to the Promotion Period the “Effective Date” will be changed and Administrator, in its sole discretion, may provide additional forms of notifications of such changes. Your continued participation in the Promotion following the posting of such changes shall constitute your consent to such changes. Administrator’s computer is the official time keeping device for this Promotion. 4.Sweepstakes Drawing: Administrator will choose the winners from the eligible entrants. Their decisions as to the administration and operation of the Promotion and the selection of potential winners are final and binding in all matters related to the Promotion. 7. Prizes: Sweepstakes Prize: The winners or top scanners during the 7 day time periods will receive a $50 Amazon Gift Card. Approximate Retail Value (“ARV”) of the Prize: $50.00. The grand prize winner or the top scanner in the month of December will receive a $100 Amazon Gift Card. Approximate Retail Value (“ARV”) of the Prize: $100.00.